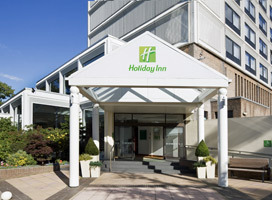 Located 2 miles from Edinburgh City Centre the Holiday Inn Edinburgh City West is a 20 minute bus ride from the many attractions and sights of this fascinating capital city. The hotel has amazing views of Edinburgh Castle which dominates the skyline from its position atop Castle Rock as well as views over Leith harbor. With a 24 hour bus service from the hotel into the city centre, guests can explore the many shops and boutiques of George Street and Princes Street with ease. With Loch Lomond and the Cairngorm National Park within a 90 minute drive, the Holiday Inn Edinburgh City west is an excellent base from which to explore the stunning Scottish landscape. All the 101 air conditioned rooms at the Holiday Inn Edinburgh City West are decorated in a simple modern style and feature satellite TV, work desk, bath, toiletries, internet access (pay for) and tea and coffee making facilities. The hotel`s Junction Restaurant serves a wide selection of International cuisine whilst the bar lounge serves a range of draught beers and whiskies as well as light snacks throughout the day. This hotel benefits from complimentary onsite parking for residents as well as an outdoor children`s play area. The hotel has parking for 80 cars which is complimentary whilst a guest at the hotel. "Friendly, clean, handy for t..."